It is now 1 a.m. Last night at eight of the clock I got back from working late at the office, to find my brother dave, now 25, lying in bed very ill. Putting the kettle on for some soup, I immediately scraped together some cash to get him some drugs, and went back out of the flat to get the lift to the ground floor. As I pressed the button for the lift, the power behind me in the flat died and everything kinda groaned to a halt. The life immediately popped up an error message – luckily I’d not got in there five seconds earlier else I would have been stuck for three hours. I checked the trip switches in our flat – nothing had tripped. Moping around our floor, I found that our neighbours had power but no water – it’s powered by the electric pumps on our side of the building. No power meant no water and no heating and it got cold quickly. Going further down I found that the entire side of our building was dead. I went down to the bottom floor and went into the “Danger No Entry Death” room to find a bunch of anciently smashed electricity boxes and piled metal. I went back up to my flat, grabbed my tealights and distributed them to everyone on my side of the building. Then I went out and got my brother some lemsip powder. I met an old resident leaving who explained this happens “every time it rains heavily and they know all about it – there’s one landlord who won’t let the others do anything about it though.” My fingers have acquired a grasping, flexing itch for the throat of this person. Two hours later the lights came back on. The water is still off as is the heating but now I can sleep, so I do. I shower at work. Tonight I got back to find that the man upstairs had turned his taps on when the water went off and forgotten to turn them off again before going out. The water from his flat was leaking down through our mains power box into our storage cupboard. Again we are without mains power (though the plug sockets are working, perversely) and have several hundred damp items scattered throughout the flat now. I am very, very annoyed. 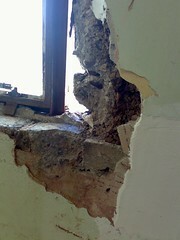 This windowframe is an example of how our building is maintained. It is a veritable deathtrap – amazingly bad walls, sewage pipes that lead nowhere, electricity connected by the medium of loose cables dangling through hacked holes in the ceiling/floor. EDIT: Woke up this morning to find the power had gone completely again, so no shower for me before popping out to view houses. Hurrah!